A bitter wind whipped across the runway at the Great Falls Municipal Airport as Major George R. Jordan approached a C-47 cargo plane sitting on the frozen runway. The plane had the large red star of the Soviet Union freshly painted on the side, and its cargo door was open to reveal dozens of identical suitcases lined up inside. Jordan nodded to a subordinate, who stepped to the open door of the plane and aimed his rifle at the two Soviet guards inside. The two Russians loudly protested, but Major Jordan ignored them and turned his attention to the suitcases. For months, he had been curious about the shipments of 50 identical suitcases sent to the Soviet Purchasing Commission in Great Falls. He knew that the Soviet officers in charge were drinking in a Great Falls hotel, and this might be his only opportunity to examine the suitcases, which he believed contained stolen morphine and other contraband. Jordan cut the cords around the cases, broke the red wax seals, and quickly rifled through the contents. Instead of morphine, he found hundreds of maps, patent documents, blueprints of industrial plants, railroad tables, and top-secret U.S. government documents. Jordan realized he had uncovered a massive Soviet espionage program, but he knew the suitcases were protected by diplomatic immunity. In a few hours the C-47 carrying the 50 suitcases would lift off and turn north towards the Canadian border, on the first leg of along trip through Alaska and Siberia to Moscow. The C-47 waiting on the runway at Great Falls was only one of the nearly 8,000 Lend-Lease planes sent to the Soviet Union via the Alaska-Siberia (ALSIB) air route during World War II, and the 50 cheap suitcases stuffed with documents represented but a tiny fraction of the information and strategic goods that flowed over the Lend-Lease “pipeline” during World War II. Under the terms of the 1941 Lend-Lease Act, billions of dollars of American aid flowed to Great Britain and the Soviet Union. The Soviets in particular needed warplanes, and lots of them, in order to fight the Nazis. The city of Great Falls was chosen as the southern hub of an air route to the Soviet Union through Canada and Alaska. In mid-1942,the U.S. Air Transport Command set up shop at Gore Field, the Great Falls municipal airfield, while construction started at East Base, six miles from town. Supplies and brand-new airplanes soon began flooding into Great Falls from factories all over the nation. At Great Falls the new planes were weatherized, were painted with the red star insignia of the Soviet Union, and were loaded with cargo before flying north. The first five planes (Douglas A-20 Havocs) destined for the Soviet Union left Gore Field on Sept. 1, 1942, and arrived in Moscow just in time to be thrown into the Soviet offensive at Stalingrad. 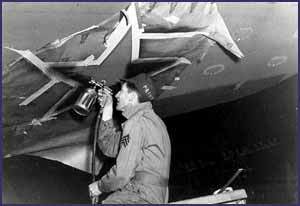 An American soldier paints the red star of the Soviet Union on a warplane at Great Falls. 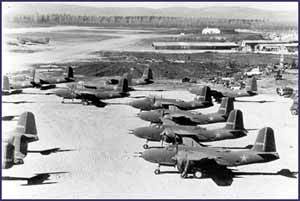 Within a few months, the two air bases at Great Falls were sending 400 fighters, 80 medium bombers, and 15 cargo planes to the Soviets each month. Although the planes were officially transferred to Soviet control at Great Falls, they were flown by American pilots as far as Fairbanks or Nome, Alaska. This treacherous, 2,000-mile trip usually took six days and involved intermediate stops in several Canadian cities. Soviet pilots took control of their planes in Alaska and flew on to northern Siberia. By the fall of 1942, Great Falls was also home to Col. Anatoli N. Kotikov and the staff of the Soviet Purchasing Commission. Their job was to purchase vital materials not available in the Soviet Union. Since the Soviet Union was critically short of everything necessary to fight a modern war, even the small fighter planes were packed with as much cargo as they could safely carry. This freight included, airplane parts and accessories, books, magazines, drills, nails and bolts, newspapers, drawings and blueprints, drugs, and diplomatic mail. The Soviet Purchasing Commission also made sure the planes bound for Russia carried luxuries unavailable in the U.S.S.R., including cigarette cases, American phonograph records, women’s compacts, and 13,000 sets of false teeth. Major Jordan was more concerned by the massive amount of documents passing through Great Falls, including those regular shipments of identical black patent leather suitcases. Despite his suspicions and those of other American officials in Montana and Alaska, the Lend-Lease program was considered so important to America’s defense that the Soviets were given virtually free rein to do what they wanted. Every time Jordan objected to the activities of the Soviet Purchasing Commission, Col. Kotikov would personally call Washington and complain about the treatment he was receiving in Montana. Jordan soon found that Kotikov wielded immense power, and there was little he could do to stop the abuses he witnessed every day at Great Falls. He did, however, begin a diary listing the materials which were being loaded on the Lend-Lease planes. Besides documents and luxury goods, the Soviet Purchasing Commission obtained large amounts of uranium, a rare substance that few Americans had ever heard of. According to Jordan, a Denver mining company shipped a ton of uranium nitrate and uranium oxide to Great Falls in March and April of 1943. The Soviets also received more than two pounds of enriched uranium, enough to build a nuclear bomb. There were other strange activities going on at Great Falls as well. Hundreds of Soviet diplomats and journalists flew into Gore Field and East Base without any restrictions. 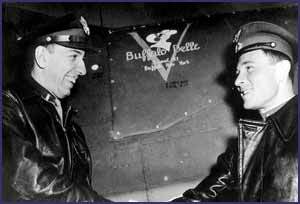 Major Gen. Follett Bradley reported, “that scores of Russians were permitted to enter American territory in 1942 without visa.” Major Jordan witnessed some of the incoming Russians hop off planes at the end of the runway, jump over the airfield fence and run for waiting taxicabs. Jordan suspected these were Soviet intelligence agents slipping into the country, and in January 1944 he traveled to Washington to discuss the Soviet activities along the Alaska-Siberia route. The FBI and Customs Service investigated, but the Soviet Purchasing Commission continued its activities without restriction. As the war wound down, traffic over the Alaska-Siberia route slowed considerably, and Lend-Lease shipments to the Soviet Union halted after the Japanese surrender in 1945. Major Jordan went public with his allegations of Soviet espionage shortly after the Rusians exploded an atomic bomb in 1949. His accusations prompted a major investigation by the FBI and the House Committee for Un-American Affairs. Many witnesses testified that huge numbers of documents, as well as more than enough uranium to build an atomic bomb, were shipped from Great Falls to the Soviet Union during the war, but the investigations concluded that much of the questionable Soviet activity had been allowed under the Lend-Lease rules. Not only had the Soviet Purchasing Commission at Great Falls pulled off one of the major intelligence coups of all time, but it had done it legally. In 1956, East Base was renamed Malmstrom Air Force base in honor of a flier killed in a training accident. Today the base is home to the 341st Space Wing and its 200 Minuteman III nuclear missiles.